Abstraction of form is a given in comics. Clouds are thoughts, sticks are people, and capes are cool. In his seminal Understanding Comics, Scott McCloud has a theory: “by de-emphasizing the appearance of the physical world in favor of the idea of form, the cartoon places itself in the world of concepts”. To McCloud, this makes “comics“ a form of language. “Words,” he says, “are the ultimate abstraction”. Simple or stylized images best encourage the reader to read the comic from panel to panel rather than just viewing the page as a whole. Abstraction facilitates the reading of sequential images. Abstract Comics, edited by Andrei Molotiu and published by Fantagraphics, chronicles the attempts of a number of cartoonists to experiment with the form. Each comic exercises a self-imposed “lack of a narrative excuse to string panels together, in favor of an increased emphasis on the formal elements of comics that, even in the absence of a (verbal) story, can create a feeling of sequential drive, the sheer rhythm of narrative or the rise and fall of a story arc”. Some showcase a complicated movement of color and texture while others use simple shapes to tell a story. Some overwhelm with intricate visual non-sequiturs while others play with blank panels. Though each artist takes a different direction, the pieces end up breaking down into two categories: they either motivate the reader to follow the logic of the panels sequentially or function as static images influenced by the visual vocabulary of comics. Leading with R. Crumb’s 1968 “Abstract Expressionist Ultra Super Modernistic Comics” from the first issue of Zap Comix!, the collection showcases cartoonists of all different genres from around the world. The work of France’s , a co-founder of L’Association, and New Zealand’s Draw of drawingsilence.com comfortably share focus with Americans more known for their strips like James Kochalka (American Elf) and Patrick McDonnell (Mutts). Swiss cartoonist and mathematician Ibn Al Rabin had a particularly impressive contribution. 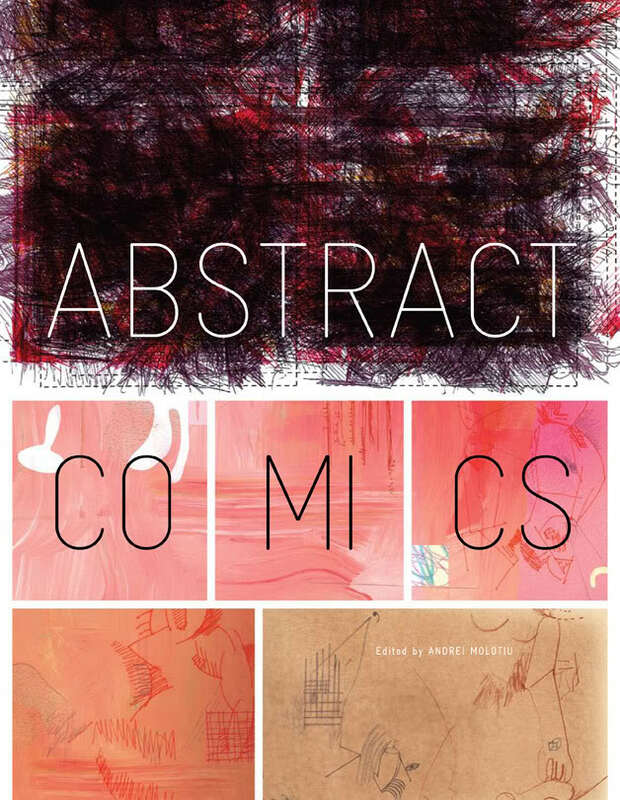 Abstract Comics is a bold work showcasing a variety of styles and interpretations of the title. Check out the blog that inspired it at http://abstractcomics.blogspot.com/.